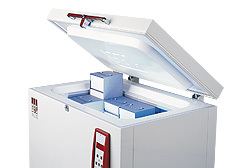 GFL Chest and Upright Freezers are used successfully in more than 70 countries all over the world. Both product ranges are designed for ultra-low temperatures of ± 0 °C to -40 °C and -50 °C to -85 °C, for long-term storage and quality assurance of organic substances and other materials. 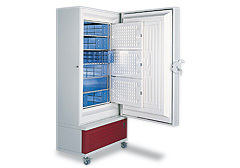 Twelve Chest Freezers available, with six cabinet capacities between 30 and 500 litres. GFL offers six Upright Freezers with cabinet capacities of 96, 300 and 500 litres.